If human beings survive long enough, the unstoppable process of evolution will cause us to speciate again, as has happened many times before. Many millenia from now, there could be several different species of human being, with any hybrids which exist being infertile. What follows is speculation regarding some possible details of this entire process. Speciation happens because of genetic drift, aided by reproductive isolation, which can happen in several different ways. For example, suppose humans establish extraterrestrial colonies. This would produce reproductive isolation by simple geographical isolation. The first such colony will likely be on the moon, and, once the colonists grow accustomed to such weak gravity, returning to earth would be extremely dangerous. Just imagine weighing six times as much as you are used to weighing, suddenly — that’s just what it would be like for a lunar colonist to return to earth. This danger would be even more severe for those actually born on the moon. If speciation happened in this way, those back on earth would probably still be called homo sapiens, with a new name given to the off-world humans, such as homo lunaris for “moon people.” As colonization moves outward, to Mars, Jovian moons, etc., other new species could form in the same way, each with an astronomically-derived species-name, and characteristics shaped by their new environment. However, back to earth. What happens here, while these new types of people are forming off-world? Well, no species lasts forever. Either homo sapiens are the last people on earth — human extinction — or we have one or more successor species here, eventually. Reproductive isolation does not require geographical isolation. Another pathway to reproductive isolation involves differences in behavior. One example is the activity of reading. You’re reading this right now, which means that you not only can read, but actually choose to do so. Do all people have this ability, or make this choice? Certainly not. What’s more, many non-readers dislike readers (otherwise, the insult “bookworm” would not exist), and, often, the feeling is mutual. Obviously, reproduction is more likely to happen between those who like each other, rather than between those who don’t. This particular split, based on literacy, has not yet produced new species. Why not? Simple: there hasn’t been enough time (yet). Writing has only existed for ~5,000 years, and education has been widespread for a far shorter time. Given many more thousand years, though, two successor species, homo literaticus and homo illiteraticus, could well emerge. Advances in medicine and computer science, combined with continuing inequality in wealth and income, could also produce variant humans another way: deliberate modification (for those who can afford it). Such modification could happen in multiple ways: manipulation of the human genome, for example, or the creation of cyborgs with organic brains, and silicon-based computers, fully interconnected (homo cyberneticus, perhaps). Such projects would be rife with controversy and ethical dilemmas, of course, but that, by itself, will not stop experimentation, any more than ethical concerns prevented humans from constructing the thousands of nuclear warheads we still have (and have, for the most part, avoided using — so far). The fact that a change would cause a lot of problems is not, by itself, sufficient to prevent that change from happening. There are many other possibilities as well. One thing is certain: we won’t simply stay like we are forever. 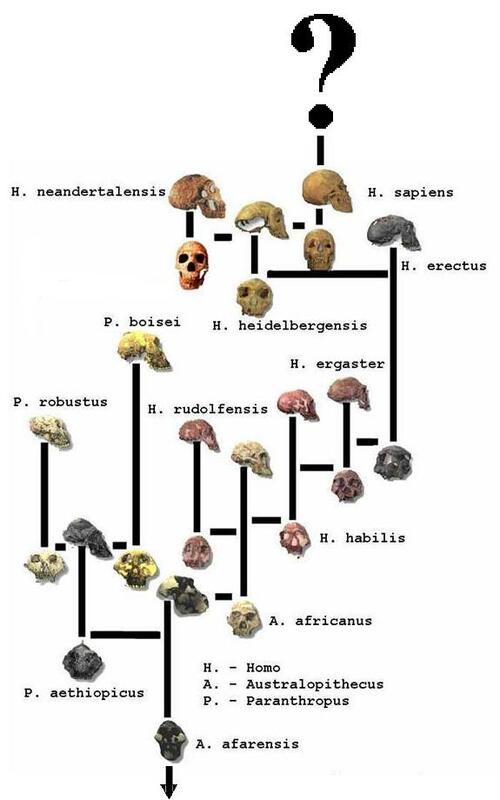 This entry was posted in Science and Scientists and tagged biology, evolution, human, speciate, speciation, species by RobertLovesPi. Bookmark the permalink. Interesting read. I was intrigued by speciation ever since I read about cryogenics.